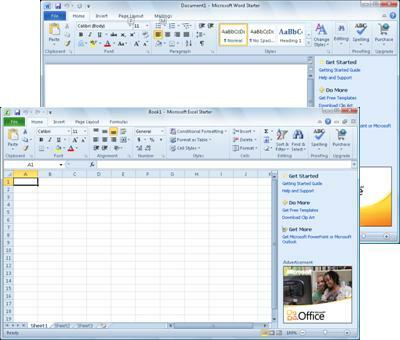 Microsoft Office Starter 2010 is a simplified, ad-funded version of Microsoft Office 2010 that comes pre-loaded and ready to use on your computer. Office Starter includes the spreadsheet program Microsoft Excel Starter 2010 and the word processing program Microsoft Word Starter 2010. Office Starter also enables you to create a device you can use to run Office Starter on another computer, when you are away from the computer you usually use. Office Starter 2010 comes pre-loaded on your computer, but it is not available until you click Microsoft Office 2010 in the Windows Start menu and then click the option to use Office Starter. Office Starter 2010 looks very similar to Office 2010. If you are new to the Ribbon interface or the Backstage view, Office Starter gives you an opportunity to get accustomed to the new interface before upgrading to Office 2010. An Office Starter To-Go device allows you to use your Office Starter programs on another computer. The device is a USB flash drive that you configure by running the Microsoft Office Starter To-Go Device Manager while the device is plugged into your computer. When the device is configured, you can plug it into another computer and run your Office Starter programs on the other computer, regardless of whether Microsoft Office is already installed. When you unplug the device, Office Starter is removed from the computer. For more information about creating and using the Office Starter To-Go device see Create a Microsoft Office Starter To-Go device. Office Starter differs from the complete version of Office in that it includes just two productivity programs (Word Starter and Excel Starter), and the interface includes display advertising. Features typically used in business or academic settings are not included. 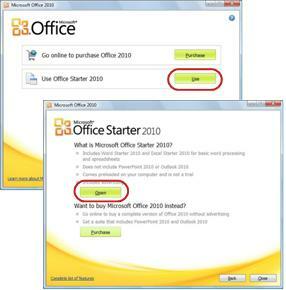 If you find that you want more features, you can upgrade to Office 2010 right from Office Starter 2010. Just click Purchase on the Home tab on the ribbon.